There are many types of MDS and this can be difficult to understand. Spend time talking to your doctor or nurse about this. It’s important that you know and understand your exact diagnosis. 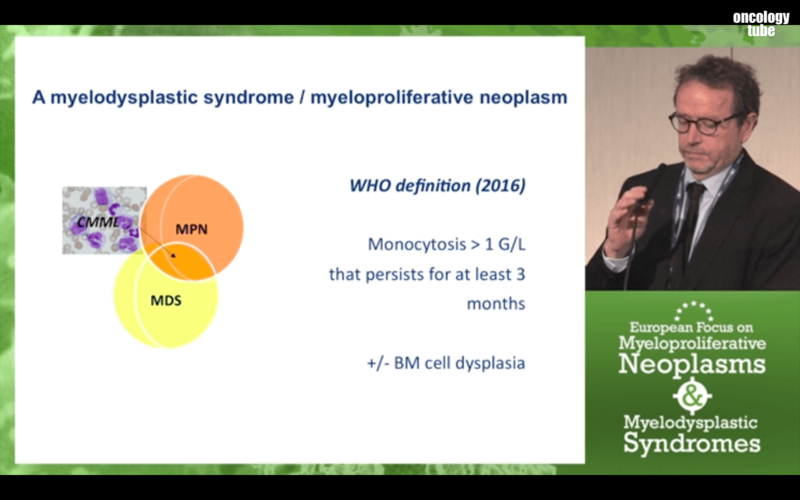 There is a generally accepted classification system for separating the different types of Myelodysplastic Syndromes. This system is based on the blood results, the appearance of the bone marrow and any chromosome changes found. The World Health Organization (WHO) regularly updates this classification based on how the bone marrow looks and the number of leukaemia cells seen. These leukaemia cells are called blasts, which may be increased in some of the types of MDS. Low blood counts are called 'cytopenias'. 'Dysplasia' means that the bone marrow cells look abnormal. 'Sideroblasts' are young red cells that typically have a ring of iron granules when seen under the microscope. Del(5q) is a specific type of MDS where chromosome tests show part of the chromosome five is missing. 'Refractory' means obstinate, and refers to the fact that the low blood count seems resistant to treatment. This booklet has been written to help you understand more about MDS. Learn more about the different types of MDS in Chapter 5. In the past, Chronic myelomonocytic leukaemia (CMML) was considered a type of MDS. In CMML, one specific type of white cell is raised in the blood. 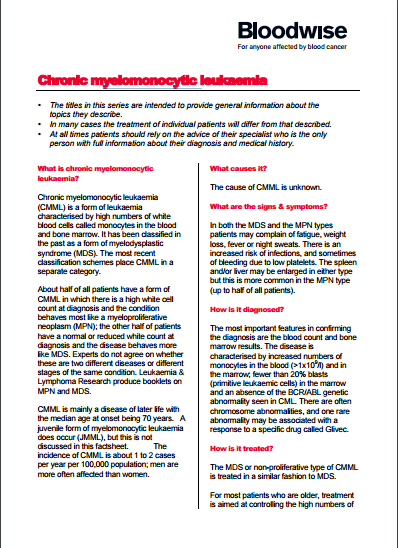 Bloodwise provides a CMML Factsheet. 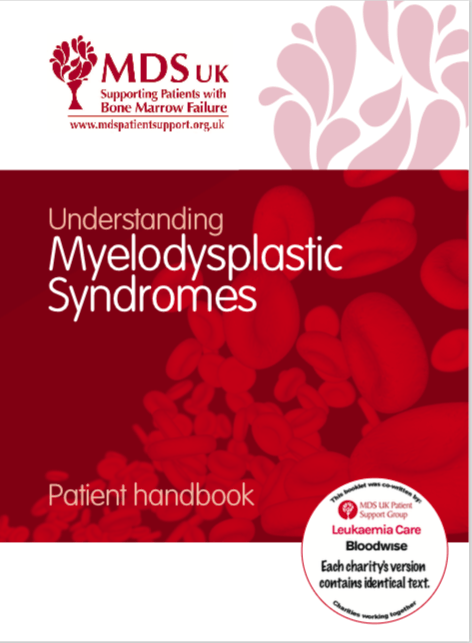 Other booklets from Bloodwise with loads of useful information are available on their download page: Patient information booklets. This presentation is very scientific, but stresses the importance of knowing your exact gene mutations. Treatments such as Azacitidine are mentioned to be of benefit, but clearly much more needs to be done for patients with this specific type of MDS/MPN overlap disease.